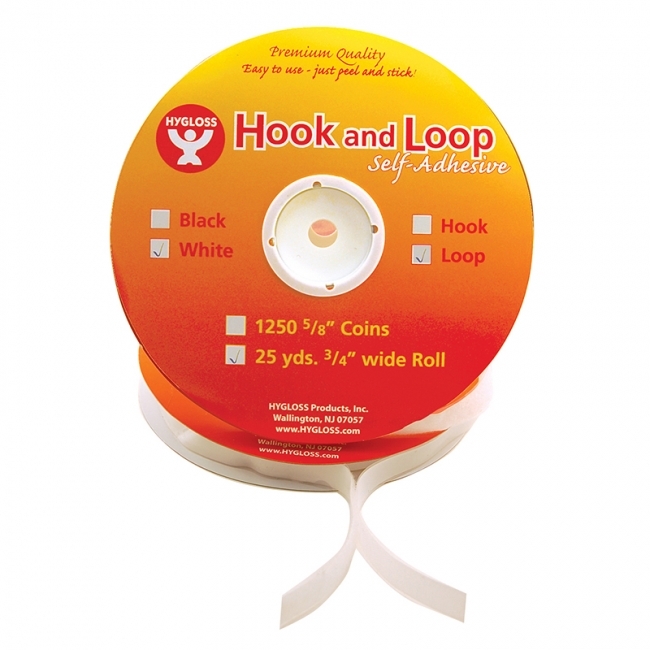 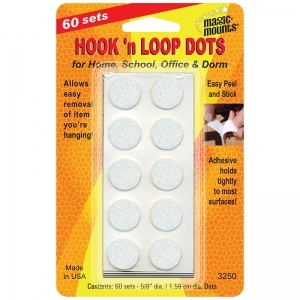 Hook and loop fasteners are a convenient way to display crafts projects and decorations, secure costumes and more. 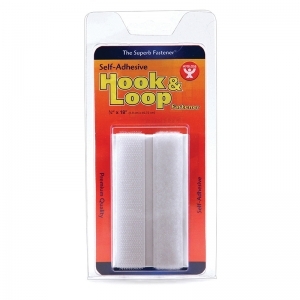 Easy to attach and long-lasting, just peel and stick our adhesive hook and loop fasteners and you're ready to hang. Box contains a roll of hook and loop fasteners measuring 3/4"x 5 yards. 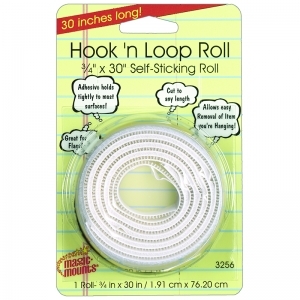 An easy, no-mess way to fasten things together. 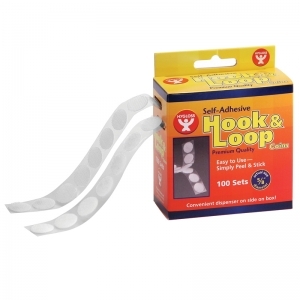 The hook & loop interlock for a strong hold. 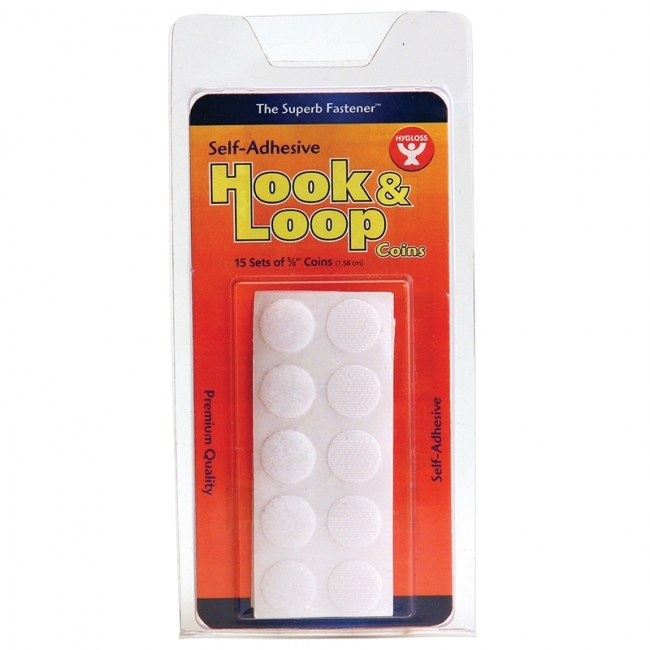 Both hook & loop are self-adhesive. 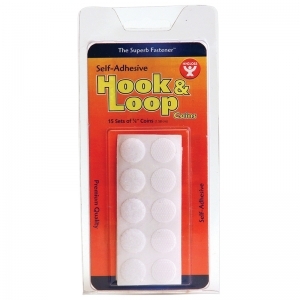 Box contains a roll of hook and loop fasteners measuring 3/4"x 18". 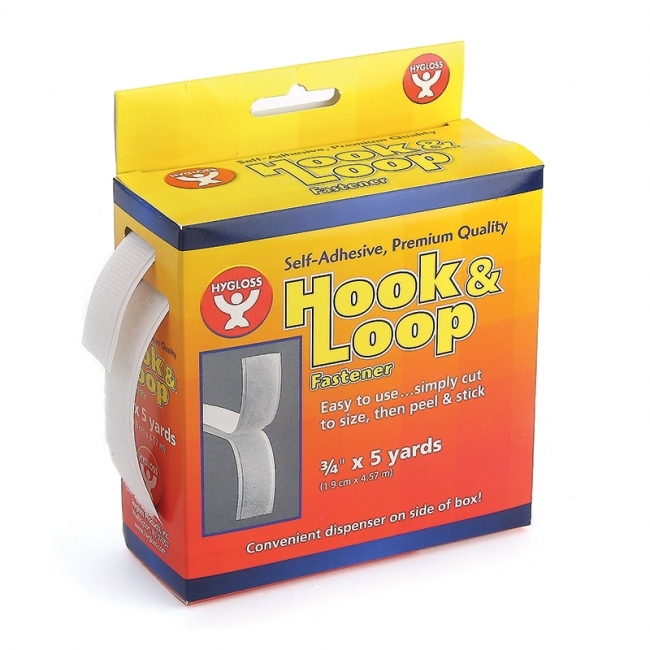 Box contains a roll of hook and loop fasteners measuring 3/4"x 25 yards . 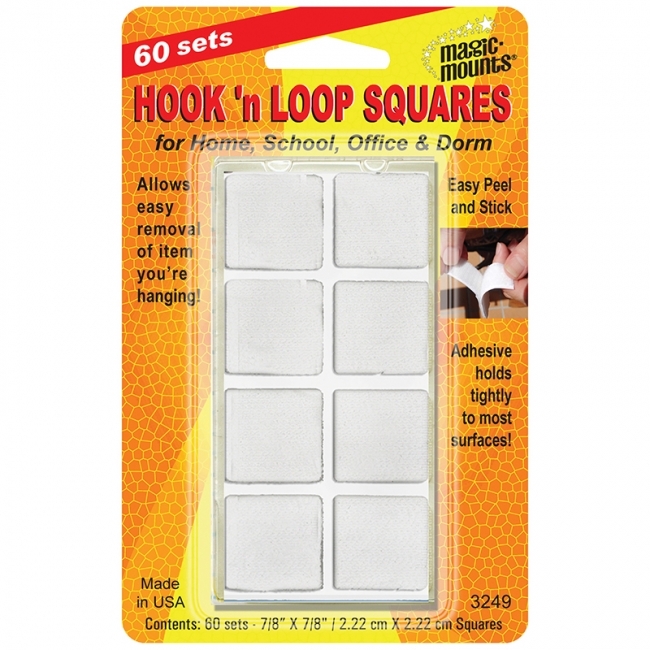 Hook and loop fasteners are a convenient way to display crafts projects and decorations, secure costumes and more. 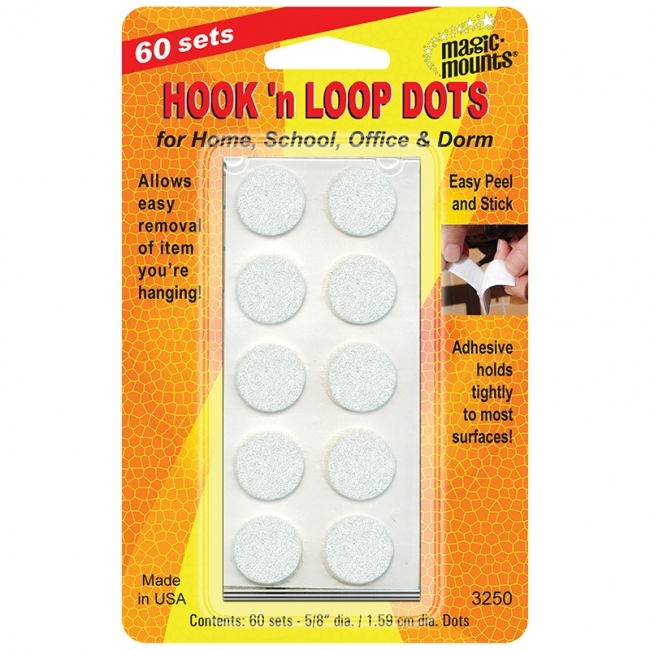 Easy to attach and long-lasting, just peel and stick our adhesive hook and loop fasteners and you're ready to hang. 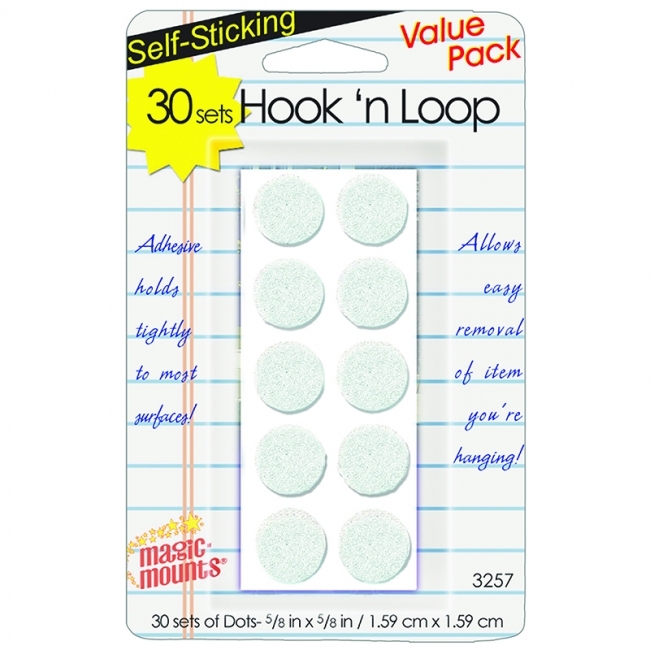 5/8" coins in a box of 100. 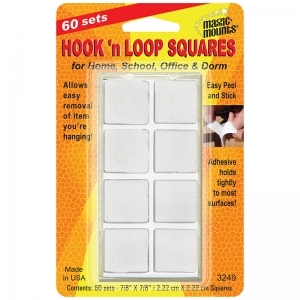 Hook and loop fasteners are a convenient way to display crafts projects and decorations, secure costumes and more. 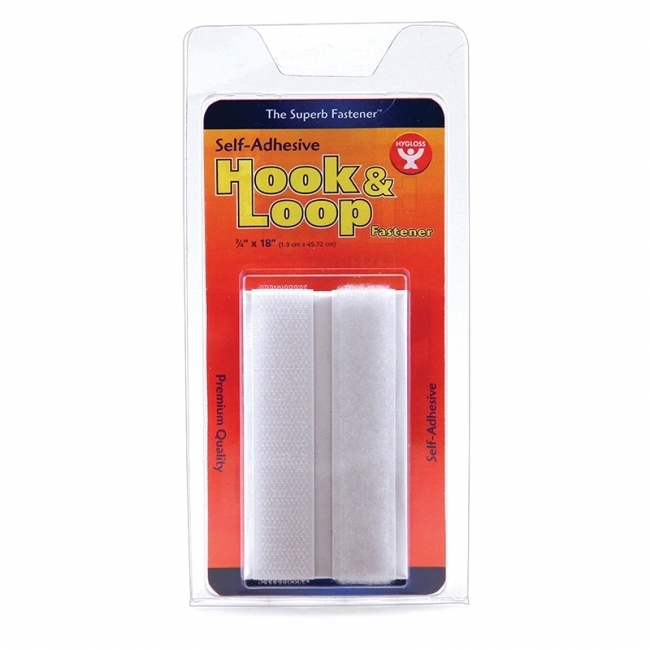 Easy to attach and long-lasting, just peel and stick our adhesive hook and loop fasteners and you're ready to hang. 5/8" coins in a box of 15. 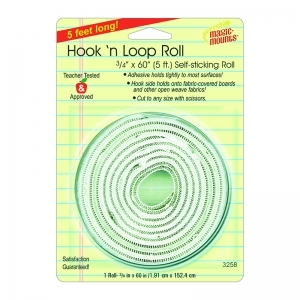 • Each square measures 7/8"
Convenient size roll for larger applications. • Roll measures 3/4" x 30"
• Roll measures 3/4" x 60"
VELCRO® Brand Sticky Back hook and loop fasteners are ideal for smooth surfaces and can be used for indoor or outdoor applications. VELCRO® Sticky Back Tape can be trimmed into strips of different lengths with a pair of household scissors. 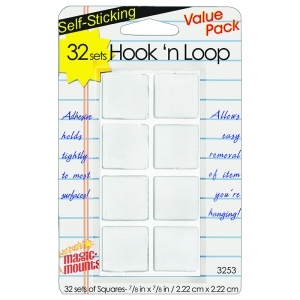 Package contains 15 - 5/8" coin shaped tabs. VELCRO® Brand Sticky Back hook and loop fasteners are ideal for smooth surfaces and can be used for indoor or outdoor applications. 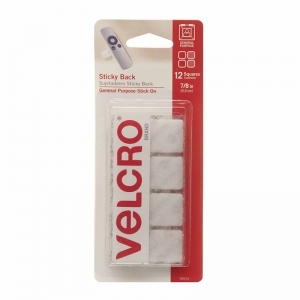 VELCRO® Sticky Back Tape can be trimmed into strips of different lengths with a pair of household scissors. 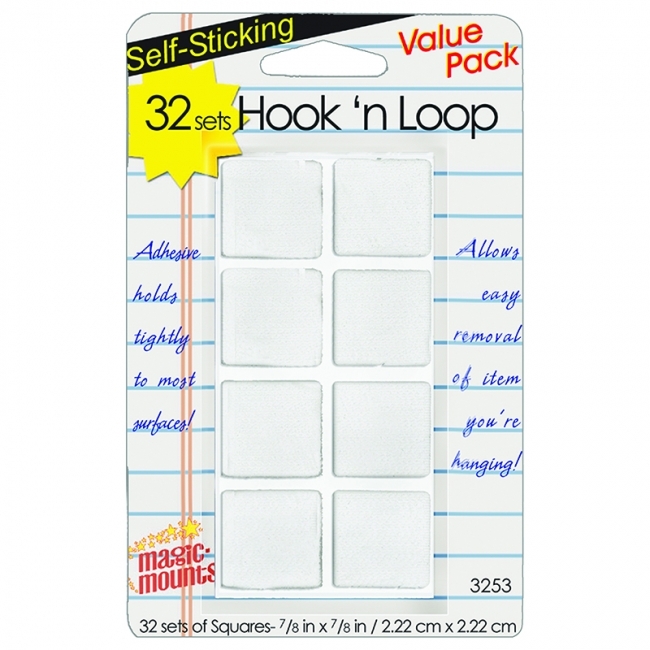 Package contains 12 - 7/8" square shaped tabs. VELCRO® Brand Sticky Back hook and loop fasteners are ideal for smooth surfaces and can be used for indoor or outdoor applications. VELCRO® Sticky Back Tape can be trimmed into strips of different lengths with a pair of household scissors. 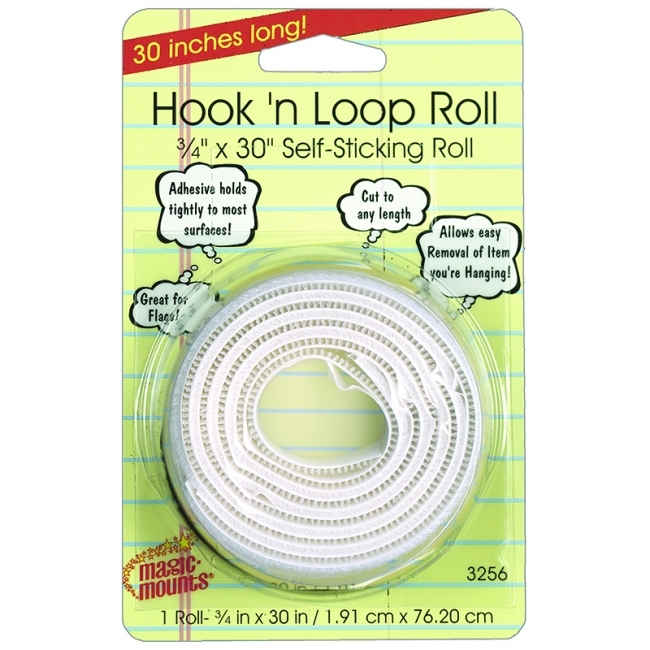 Package contains 4 white strips that measure 3/4" x 3-1/2". 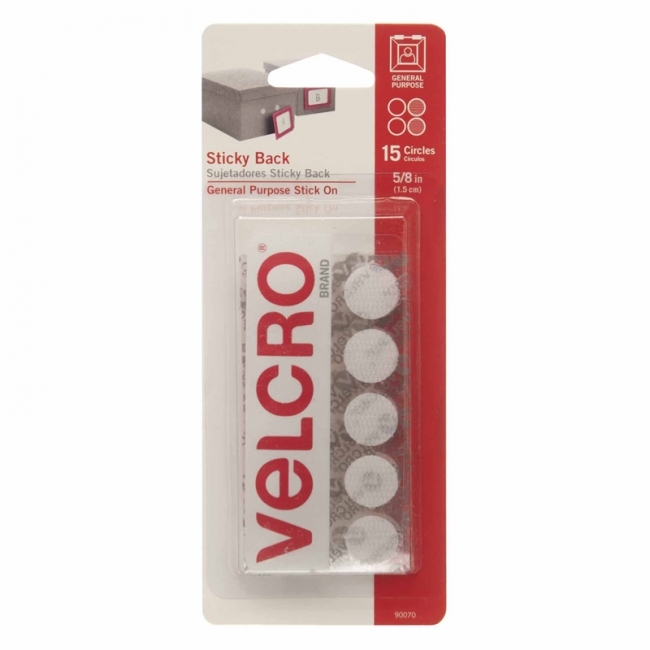 VELCRO® Brand Sticky Back hook and loop fasteners are ideal for smooth surfaces and can be used for indoor or outdoor applications. 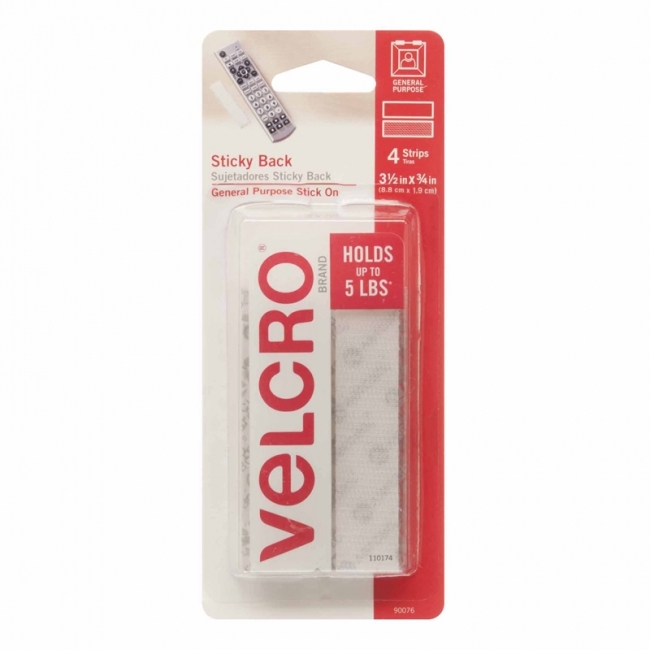 VELCRO® Sticky Back Tape can be trimmed into strips of different lengths with a pair of household scissors. 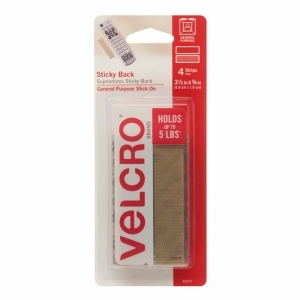 Package contains 4 beige strips that measure 3/4" x 3-1/2".